Clear aligners are a convenient choice among all orthodontic treatments. 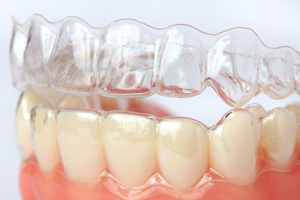 Made of a clear, flexible material, aligners are comfortable, virtually invisible and removable, making them a popular choice for adults and teens who are seeking a more discreet approach to straightening their teeth. More and more teens and young adults are discovering the many benefits of clear aligners. With clear aligners, not only is the treatment virtually invisible, the trays are also comfortable and removable, allowing patients to participate normally in their lives. With clear aligners, such as Invisalign, a series of custom-made aligner trays is used to gradually shift your teeth into place. Each tray is designed to move just one tooth or one section of teeth at a time. Once the tray’s work is complete (typically every two weeks), we move on to the next. In some cases, patients feel temporary discomfort (pressure) for the first few days after switching trays. That pressure may be uncomfortable but is actually a good sign that the trays are doing their job!